The UK celebrated with 20 venues serving chicken soup, the “Jewish penicillin,” to thousands of people. Over 40,000 people all over the world engaged themselves in Mitzvah Day activities during the third weekend of November. Among them, 25,000 were in the United Kingdom. The list of activities included cooking chicken soup which was then consumed by the homeless and visiting residents of care homes. Tea was brewed for the elderly and charity premises were spruced up. Laura Marks, the chair and founder of the event, told the media that Mitzvah Day is a mix of both celebration and social action among communities. She said it is important to remember that there is a real requirement to engage in civil society. This kind of celebration is important to bolster a society which right now feels fragmented. The UK witnessed activities being held all over the country, from the big and bustling London communities to far-flung corners of Great Britain. Interfaith activities were seen, mirroring the event's bridge building character. This is the 10th edition of Mitzvah Day. The London edition of the celebration was visited by the Chief Rabbi. For Mitzvah Day volunteers, both Jewish and Muslim, the cooking was a revelation. 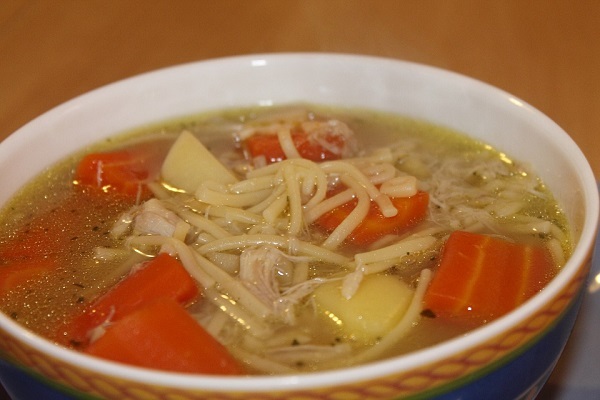 Chicken soup, popular in Jewish circles as “Jewish penicillin,” is generally served during Shabbat dinners to family members and friends. The same soup was whipped up in a mosque located in East London. Muslim Aid members and the Jewish B’nai B’rith Youth Organization sat together in long benches peeling mountains of celery, carrots, onions, and garlic. An experienced volunteer directed novices on how to cook matzo balls, the eternally Jewish traditional dumpling usually served with generous helpings of chicken soup. The ingredients for the preparation were donated by Elite Caterers, a Muslim owned company. The Tahir Iqbal managed business organization was given charge of whipping up 90 halal chickens for the communal pot. His company has donated not only the equipment and the ingredients but also the transport required for this grand cooking event. The UK had 20 venues, serving in excess of 2,500 soup servings, taking care to ensure they are not only halal or kosher but vegan and vegetarian too. Soup making events also took place in Australia, Germany, South Africa, and Poland. The biggest Mitzvah Day celebration was held in East London mosque, one of the largest mosques in Europe.